Should suspected terrorists be given military or civil trials? President Obama is under fierce political attack for the administration's decision to try Khalid Sheikh Mohammed, the alleged mastermind of the Sept. 11 attacks, and Umar Farouk Abdulmutallab, the so-called Christmas Day bomber, in civilian courts instead of military tribunals. Republican lawmakers argue the defendants in both cases should be treated as “enemy combatants” and tried in the military commissions established during the Bush administration. Administration officials and Democratic lawmakers say criminal prosecutions are more effective, having produced hundreds of convictions since 9/11 compared to only three in the military system. And they insist that Abdulmutallab is providing useful information under interrogation by FBI agents. 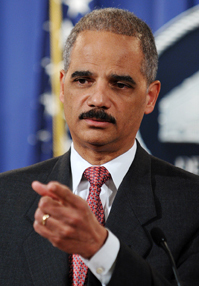 But the administration is reconsidering Attorney General Eric Holder's original decision to hold Mohammed's trial in New York City and considering making greater use of military commissions with other terrorism cases.